Anne Treisman holds a B.A. from Cambridge, England, and a D. Phil, from Oxford, England. 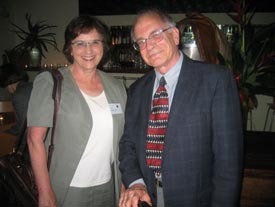 One of the central figures in building the modern sciences of cognitive psychology, Professor Treisman is one of the most influential cognitive psychologists in the world today. During her long career Anne Treisman has experimentally and theoretically defined the fundamental issue of how information is selected and integrated to form meaningful objects and memories that guide human thought and action. She has been a pioneer in studying how attention acts to select inputs for brain processing, how this process of selective attention is controlled, and its key role in constructing our internal representations for perception of objects. Professor Treisman’s creative and insightful work has inspired a whole school of experimentation and theoretical analysis leading to over 10,000 citations in the scientific literature. Its influence extends far beyond the psychology of attention and perception and forms the basis for thousands of experiments in cognitive psychology and neuroscience, vision and cognitive science, neuropsychology, as well as a theoretical framework for models of brain function, computer vision and artificial intelligence. One of Professor Treisman’s most influential contributions is the Feature Integration Theory of Attention which has had broad impact both within and outside psychology. In a series of elegant and simple experiments she demonstrated, using the process of visual target search, that early vision encodes simple features in separate “feature maps” and that focal spatial attention integrates them into a unified percept. This seminal work highlighted the “binding problem” and suggested how this problem may be resolved in the human brain. Throughout her career Anne Treisman has not only introduced novel methods and innovative solutions for some of the more challenging questions in psychology but has also trained many scientists who have gone on to distinguished careers themselves. In December 2012, President Obama named Anne Treisman as one of twelve eminent researchers to receive the National Medal of Science, the highest honor bestowed by the U.S. government upon scientists. She has also been elected to the Royal Society of London in 1989, the U. S. National Academy of Sciences in 1994, the American Academy of Arts & Sciences in 1995, and as a William James Fellow of the American Psychological Society in 2002. Among many other honors, she was the first psychologist to win the Golden Brain Award, in 1996. Anne Treisman continues to be a model and inspiration not only to her students and postdoctoral fellows but also to many other young scientists. * The FABBS Foundation would like to thank Dr. Karla Evans, Dr. Susan Fiske and Dr. Jeremy Wolfe for nominating Dr. Treisman for this honor and for leading the effort to spread the word about her nomination. Would you like to honor Dr. Treisman? It’s not too late to have your name added to the list of donors! You can make your donation to Dr. Treisman’s In Honor Of… campaign at anytime.